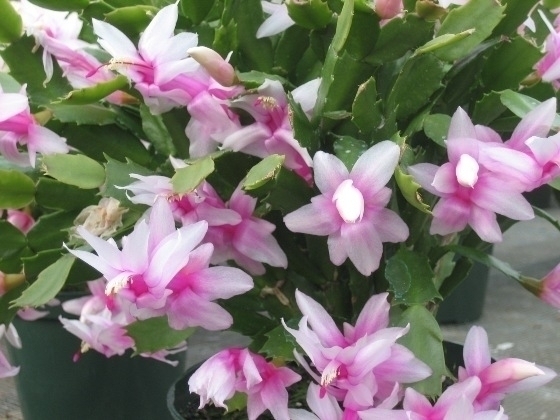 The group of plants referred to as holiday cacti includes the Thanksgiving cactus, Schlumbergera truncates, the Christmas cactus, Schlumbergera bridgesii, and the Easter cactus, Schlumbergeragaertneri. Their common names were derived from the holiday closest to their traditional bloom dates, although over the last few decades much hybridization has taken place and today’s newer developments have a more extensive blooming period. More than 300 years ago, Spanish explorers brought some of these plants from their expeditions to South America back to their native Spain. Monks tended these new discoveries in their monastery gardens. The tropical cacti burst into brilliant red blooms just in time to decorate the chapels for Christmas and they have been in demand for holiday color ever since. The color range has been greatly expanded to include white, yellow, orange, apricot, salmon, and bicolors as well as pink, red, scarlet and magenta. Newer hybrids also tend to be more erect with upward facing flowers. Some of the older varieties are especially well-suited to hanging baskets with their graceful drooping baskets and downward facing flowers. Individual blooms last about a week with the whole display continuing for almost a month. Hybrids may lengthen the seasonal show but because their flowering times are manipulated by growers through the judicious use of light and temperature, their typical bloom times under your particular growing conditions may not be discovered until the following year. The three common species of holiday cacti can be differentiated by the shape of their ‘leaves’. 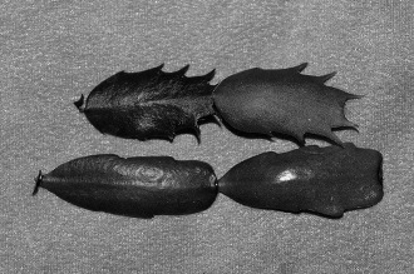 The leaves are most accurately described as flattened stem segments or ‘phylloclades’. They do not have any true leaves. 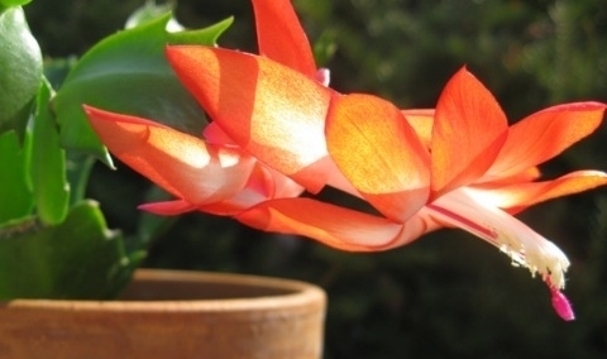 The Thanksgiving cactus is sometimes know as the crab’s claw or lobster cactus because the outer leaf margins are pointed like hooks or claws. Christmas cacti have smaller, smooth edged stem segments, and Easter cacti exhibit bristles at the end of each leaf and in between the segment joints. All three varieties are easy to grow, have similar cultural requirements and are not difficult to propagate. Their habitat is the Brazilian rain forest where they grow on the high branches of tropical trees. Holiday cacti are epiphytes meaning they physically grow on other plants but do not parasitize or derive carbohydrates from them. They are often found in the crotches of trees and get their water and nutrients from decaying organic matter, filtered sunlight and rainwater. Their growth habits explain the preference of holiday cacti species for potting mixes high in organic matter. Commercial peat-based mixes are fine but if a homemade one is desired, one source suggests 2 parts peat moss to 1 part perlite to 1 part sand. Holiday cacti are indeed true cacti but they are not as drought tolerant as their desert-dwelling relatives. Their potting mix should be kept moderately moist. During periods of active growth, plants should be watered whenever the soil begins to feel dry to the touch. Holiday cacti require excellent drainage and plants should not be allowed to sit in saucers filled with water. Plants can be fertilized once a month from April to October with a water-soluble, balanced fertilizer such as 20-20-20 or the equivalent. Ideally the middle number (phosphorus) on the fertilizer package should be the same or higher than the first number (nitrogen) for optimum blooms. Also plants prefer a slightly acidic potting mix with a pH of between 5.5 and 6.5. Check the pH before adding limestone to their potting medium. Holiday cacti do not require frequent repotting. Usually once every three years is sufficient. Check the drainage holes for excessive root growth and repot in spring if necessary. Although somewhat slow growing, holiday cacti are extremely long-lived producing a more spectacular show each year and it is not uncommon for them to live for decades if well cared for. After holiday cacti finish flowering, cut back on water slightly until new growth appears. Then resume a regular watering and fertilizing regime. Plants can be pruned in late spring to encourage branching. Removed pieces consisting of several segments can be rooted in moist vermiculite or perlite to make more plants. Remove 2 to 5 segment sections and leave them out overnight to dry. Callous tissue will form on the cut or pinched end. Place the cut end about 1 inch deep in the moistened vermiculite or perlite and place the whole container in a clear plastic bag. Secure the bag around the pot or flat. Place it in a bright area but not in direct sunlight. Check the cuttings after a few weeks for roots by gently tugging on them. Once the roots are an inch or more in length, move the cuttings into individual pots filled with peat-based potting medium. Most holiday cacti will appreciate being set outside in a shady place during the summer months. When the temperatures drop below 50º F, it is time to bring them back inside and discontinue fertilizing. For flower buds to form, plants need to be exposed to 4 to 5 weeks of total darkness for 12 to 14 hours a day or nighttime temperatures around 55º F. Short day treatments can be administered to Thanksgiving cacti starting September 1st, Christmas cacti around October 1st and Easter cacti beginning January 1st. Alternatively, plants can be placed in an area with 60 to 70º F days and 55 to 60º F nights. After 4 to 8 weeks, flower buds will appear. Plants exposed to short day treatments may then be brought back into normal light. A common complaint is bud drop. This occurs for several reasons including temperatures that are too high, exposures to drafts, insufficient light, under or over watering, low humidity or exposure to fumes from gas burning stoves. 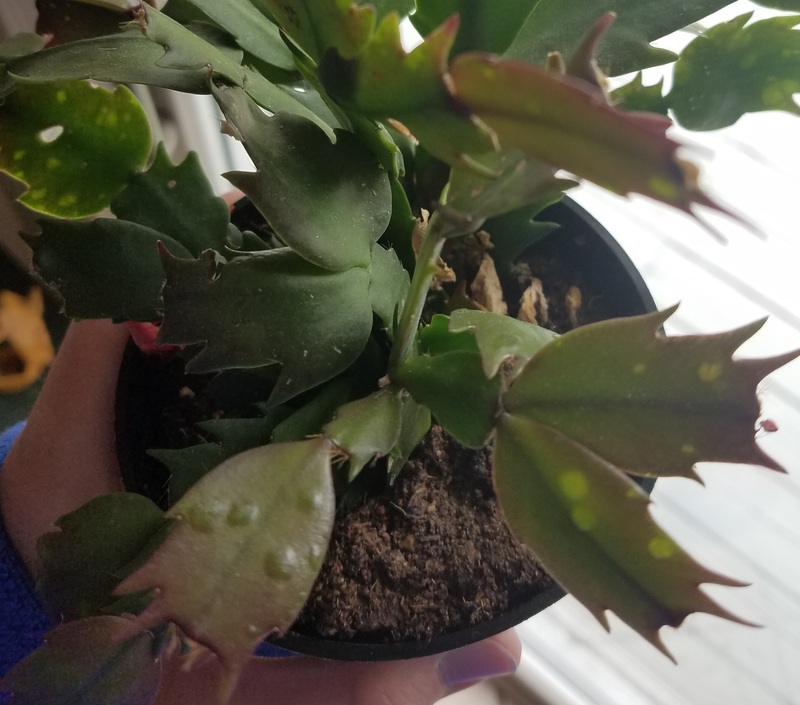 Holiday cacti prefer to be on the dry side while forming buds, during bloom times and when not actively growing which is generally from October to April. Underwatering followed by overwatering for compensation is another common occurrence. Since these plants are succulents, often lack of regular watering is not noticed until it is too late and plants begin to shrivel or droop. At this time, well-intentioned owners give them copious amounts of water. Many of the roots have desiccated during the dry period and are unable to take up excess water resulting in water logged plants that causes the remaining roots to rot. If your plant has been underwatered and is wilting, try bringing it back with smaller but more frequent waterings and not a deluge. Sometimes plants are not able to regenerate lost roots and recover. Overwatering, drops in temperatures at night, and low light can lead to edema, blister-like water soaked swellings on the foliage. The blisters can burst leaving dead corky tissue. Water plants only when the soil is dry but not desicated. Mealy bugs, scale, spider mites and aphids can be a problem which is most likely to occur when plants are allowed to spend the summer outdoors or if otherwise exposed to these insects. Contact the UConn Home & Garden Education Center (toll-free in CT) at (877) 486-6271 or your local Cooperative Extension Center for control measures.